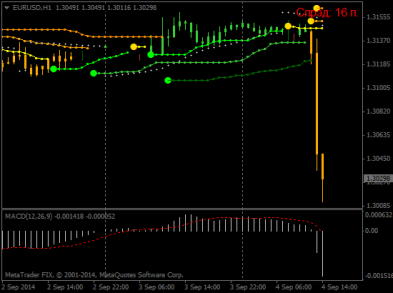 Forex Strategy for intraday trading VBBS. Forex VBBS strategy designed for intra-day trading and will be clear even to the beginner. Strategy type: indicator, intraday, swing trading. To enter a long position is necessary that all the candles were bright green, three indicator Bollinger were directed in one direction indicator with ParabolicSAR agree. Stop-loss is set for the middle band. This is a great system of filter. In the pictures Bollinge Bands Stop VBBS in action.